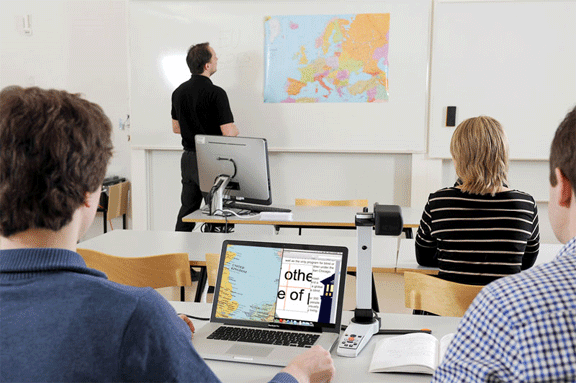 MagniLink Vision Basic HD is a video magnifier that offers users with visual impairment all the functions they need at an attractive price. It’s a modern, flexible video magnifier with an ergonomic, user-friendly design. 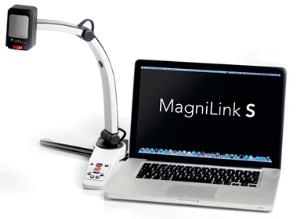 Connect MagniLink Vision Basic HD to a power socket, turn the on knob and you’re ready to start using your video magnifier! Easy for all. MagniLink Vision Basic HD is very easy to use, which makes it especially popular among older users. The control knobs are tactile and ergonomically placed directly on the integrated LVI monitor. The high-quality monitor is low vision-adapted with high brightness as well as good contrast and colour reproduction. The surface of the monitor is matt to avoid reflections. There is a choice of two monitor sizes, 18.5” and 23”. The high-quality reading table has friction brakes in the X and Y axes. The brakes can be used to provide higher resistance when the reading table is moved sideways and/or forwards/backwards. They can also be used to lock the reading table during transportation. The reading camera has a flicker-free, stable image with high contrast and clear colours. MagniLink Vision Basic HD is ergonomically designed for maximum user-friendliness and is a simpler version of MagniLink Vision, which was awarded the prestigious Red Dot Design Award. 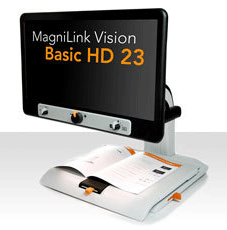 MagniLink Vision Basic HD is the entrylevel model in the modular MagniLink Vision range. The Premium-series offer additional functions such as Full HD camera, computer connection, distance camera, and TTS (Text To Speech). MagniLink Vision Basic HD is also available with a simpler SD camera, offering a lower price.